The National Gallery of Victoria recently announced its Spring / Summer 2016 program. One of the upcoming exhibitions coming to the NGV in October 2016 is Viktor&Rolf: Fashion Artists. The spectacular and avant-garde creations of international luxury fashion house, Viktor&Rolf will be showcased in a world-first exhibition developed in collaboration with the NGV. 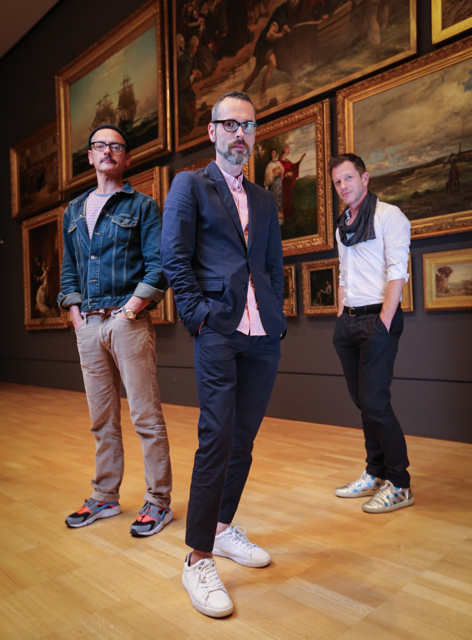 Viktor&Rolf: Fashion Artists is set to explore Viktor&Rolf’s notion of wearable art. As self-confessed outsiders of the fashion world, since forming their artistic partnership in 1992, fashion artists Viktor Horsting and Rolf Snoeren have gained critical acclaim for their rebellious approach to design, technical virtuosity, and deep knowledge of fashion history. Throughout their illustrious twenty-year career, Viktor&Rolf have carved a contradictory identity that pushes the boundaries between art and fashion, often contrasting romance and violence, exuberance and control, classicism and rebellion. The duo have become renowned for their experimental runway shows, including their 1999 ‘Russian Doll’ runway show in which model Maggie Rizer was progressively dressed by the designers in nine different layers and 2003’s ‘One Woman Show’ fashion collection inspired by actress and muse Tilda Swinton, in which the actress herself appeared amidst a runway of models made up in her likeness. The exhibition will feature some of the most show-stopping and innovative works by the Dutch design duo. These will include over 35 haute couture pieces from the designers’ collections, presented alongside earlier designs from the Viktor&Rolf archive and international museum collections. Also on display will be a selection of their work-inprogress ‘Dolls’: replicas of antique dolls dressed in the designers’ most iconic looks. The exhibition has been developed in close collaboration with Viktor&Rolf and international guest curator Thierry-Maxime Loriot, curator of the NGV’s blockbuster exhibition The Fashion World of Jean Paul Gaultier. NGV Kids will present a new large-scale exhibition by renowned luxury designers Viktor&Rolf especially for children and families - Atelier: Viktor&Rolf for Kids. In line with the independent creative vision of the Dutch design duo, the free kids exhibition will encourage children to explore and engage with their creativity through multimedia interactives and hands-on activities, including a particular focus on the olfactory experience – Viktor&Rolf fragrances have been described as a kaleidoscope of flowers in a bottle. Through cutting-edge exhibition design, lavish interiors and décor, the NGV Kids exhibition space will be transformed into a vibrant installation for young visitors to immerse themselves in the creative vision of these highly innovative fashion designers. Updated October 7th - Central to the Atelier is the presentation of the stunning wedding dress Viktor&Rolf created for the royal wedding of Princess Mabel of Orange-Nassau and Prince Friso in 2004. Inspired by the magnificent bridal gown and the fashion artists’ preference for white in a number of their collections, children are invited to construct a fashion accessory using different paper folding and layering techniques. Then, to strike a pose in a diorama setting and have their fashion moment captured in a portrait that can be shared with friends and family. Viktor&Rolf: Fashion Artists and Viktor&Rolf for Kids will be displayed at the NGV International from the 21st of October 2016 to the 26th February 2017. More info via the NGV's website.